Padmabhushan Dr. Vempati Chinna Satyam hailed from the village Kuchipudi. He belongs to its traditional performing families. He was a disciple of Sri. Vedantham Lakshmi Naryana ﻿﻿Sastry, Sri. Tadepalli Perayya ﻿﻿Sastry and Sri. Vempati Satyam. To pursue his dream of popularizing and redefining kuchipudi dance, Dr. Vempatii ﻿﻿founded ﻿﻿Kuchipudi Art Academy in the year 1963 in Chennai, India. 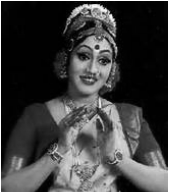 Dr. Vempati brought an undeniable sophistication and elegance to the traditional Kuchipudi dance dramas, he also choreographed several beautiful solo dances. A Perfectionist and a Sadguru of our times, with his untiring efforts made Kuchipudi dance known worldwide. Mallika is fortunate to be trained under him for a period of eight years in the traditional Gurukula System. Blessed with a stunning stage presence, she is very famous for her roles as Sathyabhama, Lakshmi, Padmavathi and Chandalika. She is the principal of Kuchipudi Art Academy, Hyderabad. She has choreographed several solo dances, classical and social dance dramas. Mallika is fortunate to be initiated in to the field of Kuchipudi and trained by "Padmasri"﻿ Dr. Sobha Naidu for a period of eleven years. Guru Late Sri Nethi Sri Rama was the son of Harikatha Kesari Sri Nethi Lakshminarayana Bhagavathar. Nethi Sri Rama Sarma had the good fortune of receiving musical training from Gayaka Sarvabhouma Parupalli Ramakrishnayya Panthulu garu for 10 years in the Gurukula system . Under his guidance of the great Guru Sri Sarma emerged as an accomplished Violinist as well as an Vocalist . As an Staff Artist of All India Radio he performed in many prestigious programs both as a Vocalist and a Violinist. He accompanied senior artistes like Dr. Balamurali Krishna and Mandolin Shrinivas. Mallika is fortunate to receive Carnatic vocal ( South Indian classical) training from him for eight years.